Self-publishing ebooks on Amazon and Smashwords or Draft2Digital is logical. All offer different distribution channels, which is ideal for getting your ebook to as many ebook retailers as possible. If you publish with Amazon KDP, there is no restriction at all on publishing elsewhere. For many self-published authors, having ebooks available on both Amazon and Smashwords or Draft2Digotal makes perfect sense, and this, which is often referred to as ‘open publishing’, is the best approach. However, the fly in the ointment is when you would like to enrol your ebook in Amazon KDP Select to take advantage of the extra promotional tools that it offers. To do so, you need to make the difficult decision to grant Amazon exclusivity. This means that you cannot have your ebook available on both Amazon and Smashwords at the same time. Therefore, you will need to remove your ebook from Smashwords, which will also mean removing your ebook from Apple, Barnes & Noble, Kobo and a number of other distribution channels. Most self-published authors have probably tried Amazon KDP Select, and for many, it is beneficial, as it can help boost both sales and ranking during the 90 days of enrolment. If you have more than a few ebook titles, a strategy of having one or two ebooks in KDP Select at any one time can be a good sales and marketing move. This strategy though involves making absolutely sure that when you enrol an ebook in KDP Select that the title has been removed from not only Smashwords or Draft2Digital, but also from ALL their distribution channels. As many authors have discovered, un-publishing an ebook does not necessarily mean that down the line distributors react quickly. This can result in receiving a nasty email from Amazon stating that your ebook is not available exclusively on Amazon, and will result in your ebook being disqualified from KDP Select. Famously, Smashwords ended their ebook distribution agreement with Flipkart due to the inability of Flipkart to remove titles in a timely manner. This tardiness by Flipkart resulted in many authors being notified by Amazon that their ebooks would be removed from KDP Select. Related reading: What’s The Difference Between Amazon KDP and KDP Select? So how can you make sure that your ebooks will be removed in a timely manner from Smashwords and their distributors when you want to enrol in Amazon KDP Select? There are many authors who wish to use Amazon KDP Select from time to time, but for some, this can cause problems. The best way to ensure that an ebook will be totally exclusive Amazon is to make a small adjustment to the ebook’s distribution settings on Smashwords or Draft2Digital well in advance. From my own experience when I un-publish a title on Smashwords in readiness to enrol in KDP Select, I have had no problem at all with Smashwords’ three main retailers. Apple removes a title within 24 hours. Kobo in less than 48 hours. Barnes and Noble are a little slower at 3 to 4 days. The same goes for Draft2Digital. It is worth considering that these three retailers probably make up around 90% or more of sales, so my advice is to restrict aggregator distribution to these three retailers if your marketing plan involves going ‘in and out’ of Amazon KDP Select. From your Smashwords Dashboard, go to the ‘Channel Manager’, and change your distribution settings. There is not enough room in the image above to show all of the distributors, but by opting out of all except for Apple, Kobo and Barnes & Noble, you can be certain that when it comes time to remove your title, it will be done quickly and efficiently. 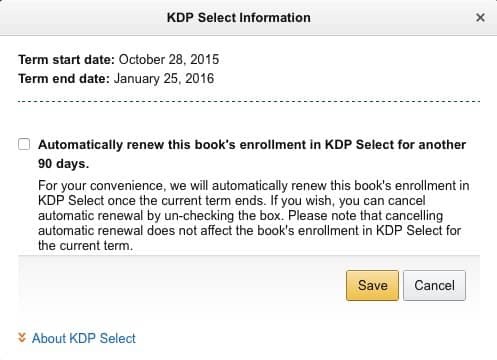 One other vital point to remember when enrolling in KDP Select is to deactivate automatic renewal. Once you have enrolled, make sure you un-tick the auto-renewal option and click ‘Save’ if you only wish to enrol your ebook for one period of 90 days. While open publishing would be the number one preference for most self-published authors, the reality of ebook sales at the moment is that Amazon, and especially KDP Select with its Kindle Unlimited option, is leading the market in ebook sales and now in subscription royalties. Whether you agree, disagree, like it or not, Amazon has the largest market share by a very long distance. This means that self-published authors cannot ignore the real and potential income that Amazon can generate for them. So this means balancing ebook distribution between Amazon and Smashwords or Draft2Digital and having to chop and change from time to time, by having titles going in and out of Amazon KDP Select. By changing your distribution settings with your aggregator, it will make this process more reliable when the next time comes to enrol an ebook title in KDP Select. Another question – can your book be free and enrolled in KDP Select? Thanks for your questions, James. Firstly, no your ebook cannot be free in KDP Select. The minimum price is $0.99. However, you can offer the book for free for 5 days each 3 months. As for having a ebook or two in Select, this is to take advantage of KU, which can help find new readers. There is however one very important topic, you did not refer to. How these companies deal with Hebrew books? I tried to upload an Hebrew book to Smashwords but it turn out that the alignment was to the left instead the right as Hebrew is written right to left. Really sorry, but I can’t help you with this one. Best to contact Smashwords and ask for help. There doesn’t seem to be ANY option to de-select auto renew on the Amazon KDP page. Do you know where it is? Auto-renew is only for KDP Select, Janice. If you are not enrolled, you will see “Enrol in KDP Select” next to your book on your KDP dashboard. However, if you are enrolled in KDP Select, you will see the option to view your KDP Select status. From there you can select or de-select auto-renew. You can only enrol in KDP Select when your ebook is not available on any other retailer. So yes. You will have to withdraw your ebook from D2D. Honestly, I’m confused about the various options for publishing ebooks through Amazon. 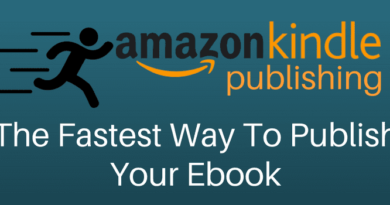 Is KDP the only way to publish an ebook on Amazon? Sorry if this is a silly question, but the more I read the Amazon site, the more unclear I am. KDP or Kindle Direct Publishing is the only way to publish on Amazon. But there are two options. Standard KDP and KDP Select. Select requires that you give exclusivity to Amazon. You can then offer you ebook through Kindle Unlimited. Thanks. It just dawned on me that you might have articles available to help me sort this out. You did! Basically, don’t click “Select”! Don’t think the exclusivity requirement will work for me. I am a publisher of mainly nonfictional technical books. I had enrolled all my books on kdp select, all are Amazon only. Some of them I move them out of the program because they contain technical knowledge I think is worth publishing in multiple sites, not only Amazon (KU/KOLL is not an option for my books, are relatively short). My question is: do I need to be exclusive to kdp publishing even when I withdraw from the kdp select program? If they had assigned me the ISBN… is that a limitation to publish in other sites? can I use my original designs (cover, abstract, etc) out of Amazon? I had published for some time now Please let me know if it’s possible to expand my distribution (Smashwords). It is easy, Alan. As long as you have removed your titles from KDP Select, you are free to publish and sell your books anywhere you choose to do so. Smashwords and Draft2Digital will both assign a new free ISBN when you publish with either. You can use the same cover, book description and manuscript. Amazon holds no rights to your books or its content. Can I publish on both PublishDrive and Amazon at the same time? I don’t think I’ll go the KDP Select route just now. PublishDrive has just signed with the major book distributor in China and I don’t think Amazon has that market distribution. If you are not enrolled in KDP Select, you can publish your ebook with any other retailers.